Despite piles of research suggesting that Roundup is dangerous, the Big Apple continues to douse its parks with the stuff—potentially exposing millions of New Yorkers to toxic effects. On Monday morning, a group plans to assemble in New York City’s Times Square to protest Monsanto, one of the largest suppliers of herbicides in the world. New York City might seem like an unlikely place to rail against a company that deals mostly with agriculture. But the protesters don’t have to look much farther than the surrounding streets and parks for their connection to the company. According to the Department of Health’s report on city pesticide use in 2011, Roundup, the weed-killing key to Monsanto’s agribusiness empire, is the city’s most heavily used liquid herbicide. Roundup is Monsanto’s signature blend of glyphosate—a compound that works by disrupting an enzyme key to plant growth—and other ingredients to destroy weeds. Parks also declined my request for a sample of the warning sign or safety protocols that it posts around areas where Roundup is sprayed, though signs from previous years noted that Roundup applications, at sites like Central Park’s Turtle Pond and Metropolitan Museum grounds, were done at 4 a.m. Parks didn’t answer my question about how long it warns passers-by away from sprayed areas. Even the city’s Department of Environmental Protection uses and supervises the use of Roundup and other glyphosate products to treat areas within the city’s water supply lands. City reports note DEP’s use of Roundup around sites like the Pepacton Reservoir—more than 100 miles northwest of NYC in Delaware County, the largest capacity reservoir in the city’s drinking-water system, supplying more than 25 percent of its water intake—and along upstate railway rights-of-way like the MTA’s Beacon and Harlem lines. Yet when I asked DEP for a complete list of sites where it uses Roundup and other glyphosate products, and how much it uses, agency spokeswoman Mercedes Padilla got back to me to insist that “DEP doesn’t use Roundup.” When I pointed out to her and other staff that the city’s own reports detailed DEP’s use of Roundup and other glyphosate products, they said they’d look into it. I have yet to hear back from anyone in that office. According to the Department of Health’s yearly pesticide report, the city’s extensive use of Roundup is not a concern since “glyphosate poses little risk of acute poisonings or chronic health effects and has not been shown to be carcinogenic.” But the city’s own “Reducing Workplace Toxics” website lists glyphosate as a toxin to be avoided and recommends mechanical weed removal or the use of nontoxic alternatives like vinegar, alcohol, or boiling water. “[Glyphosates] are poisonous and can cause harm to humans as well,” the city page warns, adding that glyphosate can cause an array of symptoms from vomiting to low blood pressure to convulsions, “may damage liver and kidneys,” and that high-level exposure can cause irregular heartbeat and death. Other cities have taken this kind of advice and dropped their use of Roundup: Chicago decided to shun the use of chemicals like Roundup in public spaces back in 2008 and nearly 90 percent of its parks are now pesticide-free, while Boulder, Colorado, last year specifically removed Roundup from its weed-killing toolkit in part due to studies linking Roundup to a variety of health risks. Even as Parks and other city agencies continue to rely heavily on Roundup and to vouch for its relative harmlessness, its active ingredient glyphosate is undergoing a formal EPA safety review, done on such chemicals every 15 years. Roundup’s critics are urging the EPA to consider a number of new studies that link Roundup to conditions from reproductive disorders to neurodegenerative diseases like Parkinson’s to cancer, and assert that the new science shows that Roundup is toxic at far lower concentrations than previously believed. 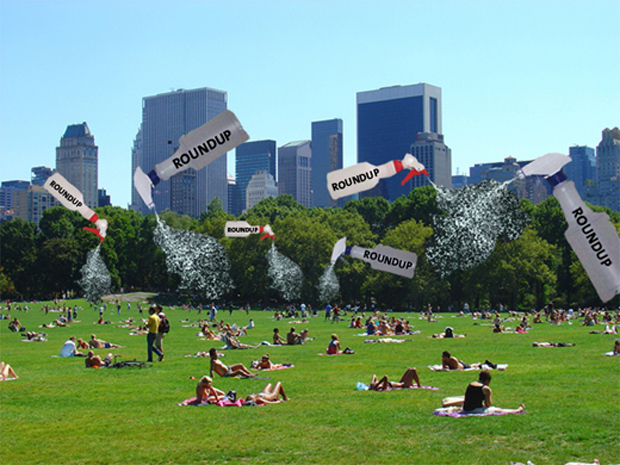 New York City’s use is indeed just a drop in the ocean of Roundup being doused on the planet. And the New York protesters are hardly alone. They’re part of a group that calls itself Occupy Monsanto, and in the coming weeks, they’ll demonstrate all over the world, from Topeka to Moscow. Last week nine people were arrested during Occupy Monsanto’s Southern California action. While the protests are more focused on the biotech products designed to be tolerant to Roundup than the weed killer itself, it’s impossible to separate the two. The bestselling herbicide of all time, Roundup was introduced by Monsanto in 1974 and became the company’s flagship product when in the late 1990s it began selling “Roundup Ready” seeds like soy, corn, and cotton genetically engineered to be tolerant to it. More than 90 percent of soy and 70 percent of corn grown in the US are now Roundup Ready, as well as vast swaths of farmland outside the United States like the GMO soy belts of Argentina and Brazil. In addition to its use on omnipresent Roundup Ready crops, Roundup is also now used increasingly for cosmetic gardening purposes, by city park maintenance crews, for roadsides, railways, sidewalks, lawns, and as a Monsanto spokesman once put it, to “protect schools.” It’s even been used as a key weapon in the US government’s global counternarcotics programs, such as in Colombia, where crop dusters have sprayed it over suspected coca and poppy fields, including UNESCO nature reserves, as part of our Plan Colombia offensive. Roundup is used so much that scientists around the world are reporting with alarm the extent to which glyphosate is turning up in the food, water, and even the air around us. A German study this year, for example, even found glyphosate in all of the urine samples it took from nonagricultural workers in Berlin, at levels 5-20 times the limit for drinking water. Meanwhile, as Mother Jones‘ Tom Philpott has reported, glyphosate-resistant “superweeds” have sprouted and spread across millions of acres of US farmland. A team out of a French national scientific research center has over the past few years published a series of studies reporting that Roundup provokes the first stages that lead to cancer, by inducing dysfunctions in cell cycle regulation. Last year, Earth Open Source—a nonprofit whose mission is to challenge Big Ag’s chemical safety claims—conducted an extensive review of the studies in Roundup’s regulatory approval dossier, and suggested that regulators should have noticed that Roundup was associated with an increased rate of birth defects in lab animals. Also last year, a microbiologist with the USDA warned that Roundup affects the root structure of plants and is suspected of causing fungal root disease. A team of French researchers published a series of studies reporting that Roundup provokes the first stages that lead to cancer. This year, an Austrian study connected exposure to Roundup UltraMax to DNA damage. The scientists noted that they saw damage even when Roundup was diluted 450 times more than its typical agricultural concentration. In March, a study out of the University of Pittsburgh reported that tadpoles exposed to Roundup changed shape due to their stress hormones responding to Roundup as if to a predator—a study of particular note since Monsanto has long claimed that Roundup only affects plants, not animals, as it targets an enzyme present only in plants. And in April, scientists out of a Shanghai medical school reported that glyphosate had neurodegenerative impacts associated with conditions like Parkinson’s. As proof of Roundup’s safety, Monsanto pointed me to its website, which details the “authoritative sources” that vouch for it. These sources include regulatory agencies like the EPA, that rely on Monsanto-supplied data, as well as Monsanto-assisted scientific reviews. The scientific consultancy firm that helped put together Roundup’s primary safety review published in 2000, Cantox, advertises itself as a company whose job is to develop “strategic regulatory and compliance plans” that “facilitate timely global regulatory approvals” and “protect our customers [sic] interests.” The Cantox-assisted key Roundup safety review was published in the journal Regulatory Toxicology and Pharmacology, an often controversial industry-friendly publication that a group of 40 scientists wrote a letter in 2003 to protest as having “corporate conflicts of interest,” and serving as a “convenient venue for the publication of industry research” due to the journal’s history of publishing the findings of paid industry consultants. Another firm behind Monsanto-funded research backing Roundup’s safety published within the past year is Exponent Inc., which promises clients “bottom line results.” In the 2008 book Doubt Is Their Product, author and former government regulator David Michaels refers to Exponent as “one of the premier firms in the product defense business,” famous for its ability to “manufacture uncertainty.” Michaels details other chemicals whose risks Exponent has minimized, including atrazine, perchlorate, and MTBE. “While some may exist, I have yet to see an Exponent study that does not support the conclusion needed by the corporation or trade association that is paying the bill,” Michaels wrote. Mayor Mike has worked hard to cast himself as the pioneering public health-conscious and green mayor of the world, leading a global group of mayors fighting climate change and protecting New Yorkers from the dangers of overly large sodas. Whether Monsanto’s ubiquitous chemical cocktails get raised to the level of concern afforded to sugar remains to be seen.